Ive reloaded many thousands of 45 acp target loads, many with the star 185 swc-hp, and was testing the other day and found out something interesting. I usually crip my rounds to .469 , they shoot and feed good so i stuck with it. Back years ago when i ransomed many loads i would keep the targets and list the load info. The other night i was looking thru them for a good load using Bullseye powder since i have been loading with just Vit-310 and wanted to change things up a little. I ran across one that had a great target, 1.5'' @ 50 yds, the basic difference in my load that day and now was the crimp was .472. So i loaded 9 rounds with .472 and 5 with .469, just to play with, i was very surprised at what resulted. 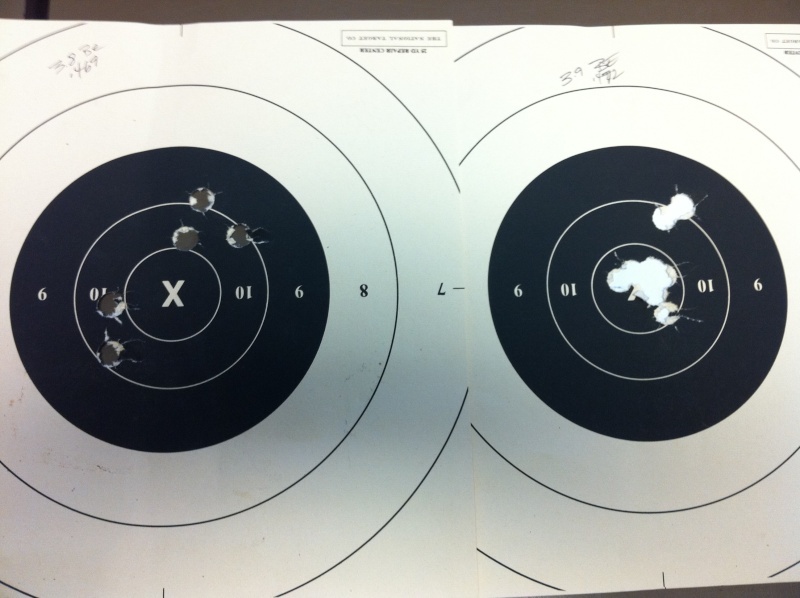 Both targets shot off hand at a indoor range that was only 50 feet deep, target on left 5 in the 10 ring, i thought ok not bad, then shot target on right with same load except with the .472 crimp. Shot 5, all in one hole, reloaded and shot the other 4. 2 more in x and 2 right together which was do to my grip, loosening a little i suppose. I know this was not a perfect test but it did open my eyes as to how the crimp can make a difference. Too add to my post, the lighter crimp while more accurate sometimes leads to failure to feed in a 1911, so i only use the lighter crimp on 50 yard loads and .470 on timed and rapid loads. Crimp is one variable to test when trying to get the most accurate load. I've heard some knowledgeable people say that they use a very heavy crimp and get great accuracy. IIRC, most were using a Star loader and dies. I did some tests years ago with Nosler bullets and Star bullets loaded for .45 ACP. I don't remember the brand of taper crimp die I was using, but it wasn't Star. I shot the ammo on a Ransom Rest. I used a very heavy crimp and moderate crimp (.470"). The heavier the crimp was, the worse the groups got at 50 yards. A heavy crimp might work for some, but it doesn't work for me. heavy crimps only work on hard bullets and then .467 is as low as you should go. the cause was a reload with a short case. did not “work” case mouth brass as severely as the roll crimp. in the case when it hits the loading ramp. of accuracy are we talking about for these taper crimped reloads? spent if I bought reloads even though I had two Star reloaders. Joe Maszk come to mind. Frank Shuster was a top bullet caster also. years, paying a small royalty for use of my design. I have crimped below 465 with no problems. I would be interested to know if you were using a Star taper crimp die and what type of bullet, i.e. cast or swaged. I think this goes to show that there are no absolutes in this game. What works for one may not work for another. Although, there are good guidelines and starting places from which one may begin without re-inventing the wheel. Frank Shuster was a top bullet caster also. .463” at the case mouth gave the best accuracy. Crimp is only suppose to straighten out the bell of the case and taper to allow a good entrance of the bullet into the barrel and give enough pull out force to allow a good powder burn. Any more than that really doesn't increase accuracy, and if so tight it deforms the bullet will decrease accuracy. Also the amount of precieved crimp, is also based on the thickness of the case. A thin case with the same amount of crimp as a thick case will read different, .465 can be the same as .467 just from the different brass. My tests were done with mostly starline cases some other brands are thicker, some like Remington are thinner. Back when Giles loaded from my research, he was loading bullets he had cast and they were very hard. If you try and crimp a soft lead bullet more than .469 you start to deform the bullet, you might crimp a hard cast lead bullet to .467 or even .465 with no deformity. If your crimp doesnt deform the case or bullet and allows good feeding, then dont worry about numbers. My first Kart barrel liked a very hard crimp (.463-.465) that I found through extensive Ransom testing. I was using a hard cast H&G 68 bullet and 4.4 gr WST. I tried every crimp level from .463 to .471 in my tests along with several fast powders (Bullseye, Solo 1000, WST, Clays and a couple others I can't remember). That barrel really liked a hard crimp. My second Kart is more in line with the norm. It likes .469 with a softer bullet than what I originally used (I quit water quenching my bullets) and the same powder charge. Short line I stick with 3.5 gr Clays with the H&G 130 and a harder crimp (only because I'm paranoid about feeding failures in sustained fire) of .467. I had some dialog with Dave Sayler some time ago, he also likes a hard crimp, but he sets his creations up to digest and deliver excellent accuracy with those parameters.